Welcome to Enclosures International, your full-service specialty item packing, storage and transportation specialists for 40 years. Since 1977, antique dealers, collectors, curators, interior designers, and auction houses have trusted our highly trained professionals to handle their valuables, including antiques, fine art, pianos, furniture, and heirlooms, with the utmost care and attention. With competitively priced services, decades of experience, and the industry's leading techniques and materials for packing, Enclosures International is the premier choice for transporting your treasures anywhere in the world. In our business, we treat every item we are entrusted with as irreplaceable. We take every precaution in our packing and shipping practices, and go above and beyond in our storage and transportation methods. Our custom-made crates and packing solutions protect the most delicate of items from damage. We are readily available to provide secure pickup and delivery services anywhere in the country. Upon pickup, we follow every package using our custom tracking system, so we can account for your item's location at any time. When your valuables are in our care, we carefully control its environment every step of the way, from air ride trucks to secure warehouses. We specialize in handling fine art, fragile antiques, family heirlooms, furniture, musical instruments, electronics, and sculptures, and offer standby services upon delivery to apply our expertise in helping you with installations and rearrangements. From international air to ocean freights, we have the resources and network to safely and reliably transport your valuables to any destination in the world. Enclosures International is a family owned and operated company where many of its employees have 40-plus years of experience in the business. Our dedicated, confidential and dependable services have earned us consistent praise from the most exacting of clients. We shaped our exceptionally high standards from years of extensive experience working with some of the world's most famous auction houses, such as Sotheby's, Christie's, and Bonhams & Butterfields. From pickup to drop-off, you can rely on Enclosures International to give your valuables the specialized care and attention they deserve. Enclosures International hand crafts made-to-order shipping crates in San Francisco, CA. 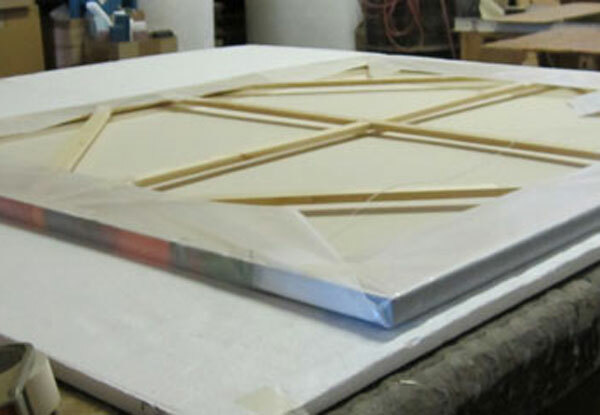 This shipping crate was custom made to ship a piece of artwork safely to its new owner. The artwork is carefully wrapped then packed into the crate to protect it from possible damage during shipping.